When it comes to preventing tooth decay, how often you eat can be just as important as what you eat. Tooth decay has long been linked to eating sugary foods — however, sweets are just part of the equation. Whether or not you develop cavities depends on many factors — including the foods you eat, how often you eat, whether or not you get regular dental checkups, the genetic makeup of your teeth and how much saliva your body naturally produces. Everything you eat passes through your mouth — and when you eat foods that contain carbohydrates, changes occur that potentially can lead to cavities. Bacteria contained in the plaque that constantly forms on our teeth mixes with carbs to make acids capable of damaging tooth enamel. And so, over time, exposure to these acids may cause tooth enamel to break down — resulting in cavities. But there are some things you can do to help minimize the amount of acid created by the bacteria on your teeth — thus help prevent tooth decay. Eat a healthy diet based on variety, balance and moderation. An adequate supply of vitamins, minerals and other nutrients is essential for healthy teeth and gums. Limit between-meal snacking to help reduce the time your teeth are exposed to acid. Bacteria in plaque produce potentially harmful acids for 20 to 40 minutes after each exposure to carbohydrates. Limit the amount of soft drinks, fruit-flavored drinks and other sugar-containing beverages, including coffee and tea with added sugar. Also, limit the amount of time taken to drink these beverages. If you choose to drink a can of soda, it’s better to do so with a meal rather than sip on it over two hours because your teeth will be exposed to acid for a shorter period of time. Drink fluoridated water if you can. Water helps rinse the teeth, and fluoride helps protect against dental decay. Avoid sucking on hard candies, mints, cough drops or lollipops. These foods have enough sugar in them to increase the acid produced by the bacteria in your mouth to decay-causing levels. If you must have a mint, choose the sugar-free varieties. Avoid giving infants a bottle of juice, formula or milk to pacify them. “Baby-bottle” tooth decay occurs among young children when their teeth and gums are exposed to carbohydrate-containing beverages for extended periods of time. This happens most commonly when babies fall asleep sucking on a bottle. If you choose to use a bottle as a pacifier, fill it with plain water. Whenever possible, brush your teeth after eating to remove the plaque-containing bacteria that create the harmful acids. If you cannot brush after every meal, brush your teeth at least twice a day using a fluoridated toothpaste that has the American Dental Association Seal of Acceptance. Floss your teeth after brushing once or twice each day to remove plaque from all tooth surfaces and where the tooth meets the gums. If plaque is not removed, it can lead to gum problems and cavities. If you smoke or use tobacco in any form, quit. Smoking or using smokeless tobacco increases your risk of tooth decay and other oral health issues. 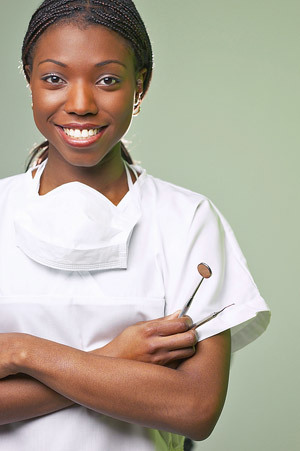 Last, but certainly not least, have regular dental checkups that include a complete oral exam and thorough cleaning. Video: Should you consider getting braces?